At SEGA, the students go on a number of field trips that give them opportunities to learn outside of the campus. Last year, the girls participated in a number of historical and cultural trips to learn more about Tanzania. They also visited the top tertiary schools in the country to help them visual life after SEGA and to teach them what tools they will need to succeed once they’ve graduated from secondary school. In 2017, the 27 students of Form One B Class took a Geography and History field trip to Saadani National Park, which is located between Dar es Salaam and Tanga, along the east coast. The goal of this trip was to teach the SEGA students about Tanzania’s rich natural resources and to bring to life concepts learned in the classroom. Uswege Aliko, the Geography and History Teacher, and Matron Stella and Brighton Chilongola (SEGA’s driver) chaperoned the trip. Students took a boat tour and visited a company that produces salt using seawater. This involved evaporating seawater to get salt deposits which are then processed to produce a final manufactured commodity. 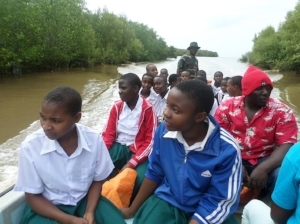 The students then took the boat along the Wami Delta where they saw crocodiles and hippopotamus and mangrove trees along the river, as well as other marine animal and plant life. The next day the students ventured to Saadani National Park where they saw giraffes, gazelles, monkeys, and many other animals. The remainder of the trip looked back in time at the historical centers of villages—the cemeteries of the missionaries who were involved in abolishing slave trade in coastal parts of East Africa, as well as the former slave prison at Saadani. A second trip to learn about Tanzania’s history took the Form 2 students to the port of Dar es Salaam and the National Museum. Students visited the museums for three hours, where they saw the car used by the last British Governor in Tanzania as well as drawings that explain the social activities and daily lives of African families—cooking, fetching water, farming, grinding maize, and making weapons. The SEGA students also learned about Tanzania’s currency before independence in 1961, like the coin used in the KILWA kingdom (around the 10th century) as well as the currency used by the Portuguese in East Africa. The next day they visited the Dar es Salaam port, which is the second largest port in East Africa after Mombasa, Kenya and learned about the Tanzania Port Authority (TPA), which manages all the ports along the shores of Tanzania’s east coast (the Indian Ocean) and the shores of the lakes in the mainland. Last year, the Form 4 class went on a career learning trip to the University of Dar es Salaam and Loyola High School in Dar es Salaam. Loyola High School is one of the best high schools in Tanzania, which focuses on academic excellence and good discipline, as does University of Dar es Salaam. The SEGA students learned a lot from the students at these schools, including what academic programs are available for them after SEGA, strategies for how to perform well academically, and how to focus on their dreams and achieve their goals. Staff and students at these tertiary schools encouraged and motivated the girls to continue to work hard and push themselves so they can have the futures they imagine. These field trips enabled students to explore new environments and to gain deeper knowledge of the topics they’ve studied in their classes. Once they returned to campus, the students shared what they learned during their field trips in front of the school during Morning Assembly. Students at the Dar Es Salaam port with the staff; kneeling, (from L-R standing) Maria John Kwanga and Stella Mswakala at the back (from L-R) Amina Zuberi, Amina Kiondo and Neema John.